The construction of the Tissue Culture Laboratory Extension and repair of existing humidity tent and screenhouse were completed on March 28, 2018 through the funding of DOST-PCAARRD. 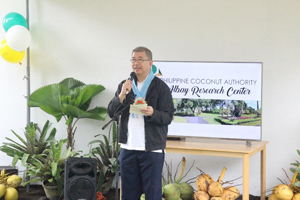 GUINOBATAN, Albay  The Department of Science and Technology (DOST) Secretary Fortunato T. de la Peña attended the inauguration of the newly-constructed state-of-the-art tissue culture laboratory at the Philippine Coconut Authority-Albay Research Center (PCA-ARC) recently. 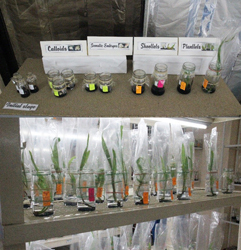 Through the funding of the DOST-Philippine Council for Agriculture, Aquatic and Natural Resources Research and Development (DOST-PCAARRD), a more spacious and fully-equipped culture room was constructed for better organization of tissue culture activities, and bigger growth room for the development of existing coconut tissue cultures. The existing screenhouse and humidity tent were also repaired for the ex-vitro establishment of tissue culture-derived regenerants. Existing cultures being maintained at the laboratory of CSet Project 4. The program, "Reinvigorating the Philippine Coconut Industry through the Coconut Somatic Embryogenesis Technology (CSet)," aims to mass propagate plumule-derived coconut planting materials for the establishment of new planting in coastal zones and replant typhoon-damaged, and CSI-infested palms. Currently, the PCA-ARC component project is able to produce and maintain 1,414 regenerants from the 11 coconut varieties collected from PCA  Zamboanga Research Center (PCA-ZRC). DOST Secretary de la Peña acknowledged the accomplishments of the program and highlighted the results as a breakthrough in agriculture. Likewise, PCA Administrator Romulo J. de la Rosa emphasized that with the significant progress of the CSet program, PCA is at the cutting edge of the tissue culture research. He added that PCA is truly grateful to DOST, specifically to PCAARRD, for its continuous support on various coconut research efforts. DOST and PCA agreed to continue and strengthen its collaboration on proper utilization of results from existing researches on coconut and further identify R&D gaps. Meanwhile, Fr. Salvador Nicolos R. Bilono III officiated the blessing of the CSet Tissue Culture Laboratory, as well as the Food Processing Facility of PCA-ARC. DOST Secretary Dr. Fortunato T. de la Peña as he delivers his message at the inauguration of the CSet Tissue Culture Laboratory. Present for the unveiling of the marker were DOST Secretary Fortunato T. de la Peña, PCA Administrator Romulo J. de la Rosa, PCAARRD Crops Research Division (CRD) Assistant Director Dr. Edna A. Anit, OIC Deputy Administrator for R&D Branch Ms. Erlene C. Manohar, Guinobatan, Albay Municipal Mayor Gemma Ann Y. Ongjoco, and PCA-ARC Department Manager and CSet Program Leader Dr. Cristeta A. Cueto. Also present on the event were PCA-ZRC Deputy Manager and CSet Project Leader Ramon L. Rivera; Bicol Consortium for Agriculture, Aquatic and Natural Resources Research and Development (BCAARRD) Director and CSet Project Leader Marissa N. Estrella; DOST Science and Technology Information Institute (STII) Director Richard P. Burgos, DOST Region V Director Tomas B. Briñas; DOST-PCAARRD Institution Development Division (IDD) OIC Director Ruel Carlo L. Tanqueco; other staff of DOST-PCAARRD and PCA; guests from Department of Public Works and Highways (DPWH) Region V; and the local government unit of Guinobatan, Albay. Fr. Salvador Nicolos R. Bilono III officiated the blessing of the Coconut Somatic Embryogenesis Technology Laboratory (left photo). PCA Administrator Romulo J. de la Rosa and DOST Secretary Fortunato T. de la Peña graced the ribbon cutting ceremony (right photo).